The Lamborghini Diablo VT Roadster was a long awaited model, ever since they showed the Roadster prototype in 1992, it would however take another three years for Lamborghini to unveil the production ready Diablo VT Roadster version. It became in instant success, especially in the more 'sunny' countries, and it must be said the styling was different from the closed version, but still very recognizable, and best of all, it featured a light weight, carbon fiber roof section that was actually stored on the engine cover when not in use. 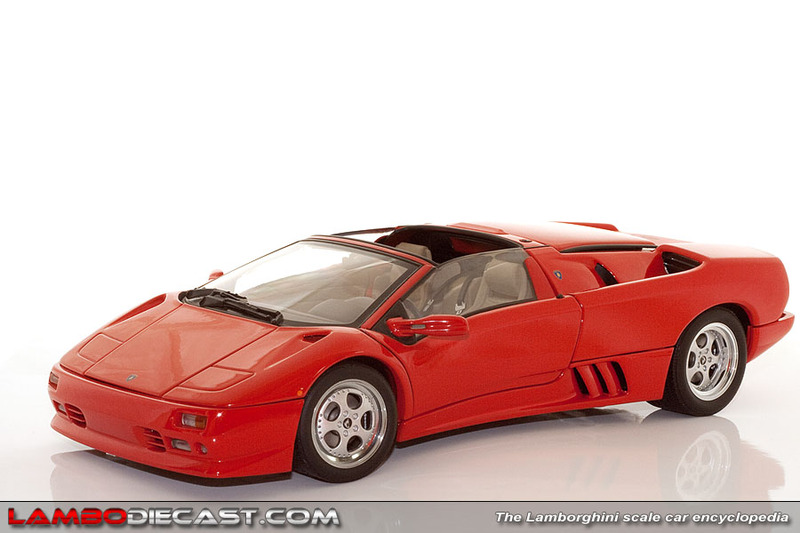 The AutoArt model on this page is the red version, and it suits the Diablo Roadster very well, do note however that at the time three colors were available, this red shade, a yellow one and a black one. Today these AutoArt models are very difficult to locate and demand rather elevated prices to add to your collection.